Dr. ​Jami ​Jo ​Thompson ​announced ​at ​the ​ribbon ​cutting ​ceremony ​for ​the ​Career ​Academies ​at ​Norfolk ​High School ​at ​10:30 ​a.m. ​on ​9/20 ​that ​the ​fundraising ​goal ​has ​been ​met. Sarah ​Dittmer, ​Executive ​Director ​of ​the ​Norfolk ​Public ​Schools ​Foundation, ​shared ​in ​a ​press ​release ​that $1.370 ​million ​dollars ​was ​raised ​to ​fund ​this ​outstanding ​project ​that ​will ​benefit ​thousands ​of ​Norfolk ​students. She ​said ​“We ​had ​a ​great ​response ​to ​this ​project ​and ​had ​donors ​at ​all ​levels ​willing ​to ​support ​it. ​Donors included ​local ​business ​and ​industry, ​alumni, ​school ​employees, ​retired ​teachers, ​invested ​citizens ​and ​grant providers ​… ​but ​the ​common ​thread ​across ​the ​donors ​is ​that ​they ​all ​could ​see ​the ​value ​in ​a ​strong ​public school ​system ​and ​the ​ability ​to ​offer ​students ​career ​and ​college ​readiness ​programs ​in ​our ​community. ​The Norfolk ​Public ​Schools ​Foundation ​is ​proud ​to ​partner ​with ​donors ​and ​Norfolk ​Public ​Schools ​to ​make ​this learning ​opportunity ​a ​reality. The ​Career ​Academy ​fundraising ​project ​included ​a ​small ​addition ​to ​the ​west ​side ​of ​Norfolk ​High ​School ​to expand ​the ​Metals ​and ​Automotive ​area, ​updated ​equipment ​where ​needed ​throughout ​the ​academies, ​plus ​an endowment ​that ​will ​provide ​funding ​into ​the ​future ​to ​maintain ​the ​integrity ​of ​the ​program ​for ​future generations ​of ​Norfolk ​Panthers. ​The ​endowment ​will ​enable ​the ​program ​to ​grow, ​adapt, ​update, ​and ​replace equipment ​as ​needed. 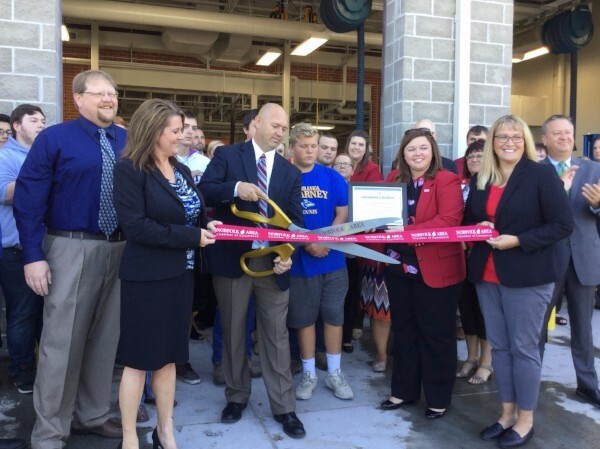 The ​ribbon ​cutting ​ceremony ​for ​the ​new ​addition ​took ​place ​on ​the ​west ​side ​of ​the ​High ​School ​and ​included the ​Norfolk ​Area ​Chamber ​of ​Commerce, ​teachers, ​students, ​local ​business/industry ​and ​many ​community members.